Guys as you all Knows Remix OS is very trending these days. So that i thought foe Post a Full Guide on How to Install Remix OS on PC Laptop, and you can Easily Install Remix OS in your Computer / Laptop and you can Enjoy Remix OS on your Computer. Previously From Long time, I was waiting for Android OS for PC, And now Finally Remix OS is Released for PC. So, You can Install Remix OS in your PC, which will Give you a Android User-Experience in your PC and you can really Enjoy Android and all features of Android in your PC. Now it is Possible to Run Android Operating System and all of Android apk Apps in your PC, With the help of this Remix OS Which is Developed by Jide Technology. So just Follow This Easy Tutorial to Install Remix OS 2.0 in your PC. Guys I want to say big Thanks to Jide Technology Developer of Remix OS, for Develop this Kind Good Operating System for PC Users. As Always Previously we were also shared an Article on How to Increase RAM in Android Phone and it is working Smoothly. There are Many desktop operating System, but remix OS is a Very new Operating System, Which you can Install in your PC and Enjoy Android Apps in it. It is kind of Android os for pc, which you can dual boot with Windows or Linux in your PC Laptop. So guys simply Checkout Full Step by Step Tutorial now from below about How to Install Remix OS in PC and after that How to Install WhatsApp in Remix OS. 1.2 What is Remix OS? If you’re looking for a Full Guide, for How to Install Remix OS on Your Computer, then you’re at right place as always, Because I will Show you Step by Step Tutorial for How to Install Remix OS on Your Pc. And I’ll Also Provide Download Link of Remix OS, Which you need to Boot in your Pendrive Like Create Bootable PenDrive and you will be run This Remix Operating System on your Computer / Laptop Easily. Also Try How to Post In Multiple Fb Group at Single Click Method, So, if you want to know that How to Install Remix 2.0 OS in your Desktop. You can Easily Know that How to install remix Os dual Boot. So, Guys I will Show you a Easy Guide, in which you can Dual Boot your Remix OS, So if you have already Installed any Operating System Like Windows Xp. Windows 7 8 Etc then you will be able to to Run Both Operating System in your PC without any Loose in Performance. This is the very Good Operating System, which you must be install in your PC So let’s have a look on How do i install remix os on hard drive. Remix Os isn’t an Android Emulator Software, This is a Another Good Operating System, which you can Install in your PC and you will be able to Run All Android App, Games and all Android Features in your PC. With this Operating System, you will be allowed to Run Android environment on your PC. Some days before i was shared Whatsapp Tips and Tricks, for use Whatsapp in more good way. This is the very best Operating System for any PC, in which you can Enjoy Android Operating System on your PC, Rather than any Emulator, which runs very Slow Due to Ram Problems. So, This Operating System will give you faster and Smoother Android User-Interface in your PC and you can easily use this Operating System on your Computer & Laptop too. So Now Remix OS is available to Download & Install on PC, Which you can checkout Now from below. Friends have a look at some of the Basic requirements, About How to Download And Install Remix Os In Pc For Free, or you can also Dual Boot it with other operating System like Windows with Remix OS. Disabled a Secure Mode, If you are Running Windows 8 or Up, Search on Google Full Guide on How to Disable Secure Mode. So guys here the thing to be Focused to Follow Remix OS Installation so, In order to Download & Install Remix OS on your PC, Simply Follow All below step by step Tutorial. You will be able to Run Remix OS on your PC With this Easy Guide. So, Just, You need to follow each and every step carefully. I’ll try my best to Mention All the Step in Easiest way as i can. You have to Do a Several things in your PC, for use and install Remix os in pc. you have to format your usb drive, and burn OS, Create Hard Disk Partition and installation process. I have mentioned all Step by Step Full Tutorial below, for Know more about How to install Remix OS in PC or Laptop. 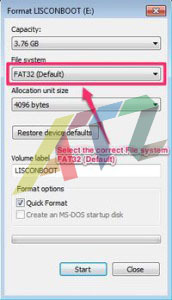 At First Make sure that you are Using USB 3.0 & Format that USB Drive in Fat 32 Format. So Firstly Backup all your Important Data from USB, Before you format. In Most of the cases, People have USB 2.0 Pendrives, So please For this purpose try to Arrange USB 3.0 Pendrive, if you want to install and Run Remix OS on your PC/ Laptop and make Sure you format Your Pendrive in Fat32 Format, not in NTFS Format. You know why Because for Make Remix OS bootable in pendrive, it needs this Requirement. This Operating System is in Alpha Stage this Time. So be Sure you follow each and every Step Carefully in your Laptop. After Successfully Format your Pendrive, now you need to Burn Remix OS in your USB 3.0 Pendrive. So for Burn Remix OS in your USB 3.0 Checkout Below steps. 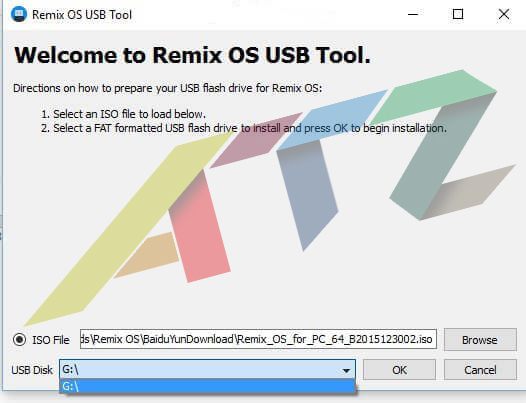 You have to make your pendrive bootable with remix OS ISO Image File. For install remix OS in your PC with the help of USB Drive, You need Remix OS USB Creator Tool. For burning Remix OS in USB Drive. Checkout Full method now from below for know more about How to Burn Remix OS in Pendrive. Guys keep in mind that This Process will take some time to Complete, it depends on Your PC Performance and Read Write Speed. So if you are in Hurry for Installing Remix OS on your PC, then you can simply close all of the other Running Software which you have opened currently. And let it done. So Give this tool some time, Sit back and relax. After it is Done Simply Follow our next Steps. That’s it Guys Now You have to Create a new hard disk partition in your PC & If you want to install Remix OS in your Pc. you can Skip this Step, if you don’t want to install this Remix Os in your Pc Laptop, and you Only want to test this remix OS 2.0 in your PC so you can try. If you want to install This OS on your Laptop then you must create a new hard disk partition of 25 GB more, so you can dual-boot this OS along with existing OS, which you have Installed in your Pc. So, Guys if you don’t know How to Create a new Hard Disk Partition, then must Search on Google about this that How to Break/ Divide a Disk Partition. It’s a very easy process, which you can easily Do. Recommended Software for Create Hard Disk Partition is AOMEI Partition Tool. You can Easily create a new partition of your existing hard disk drive and you will be able to create a Fresh New Hard Disk Volume, in Which you can Install Remix OS. So After create a new partition. let’s move to the below Steps, You can also create With Goto Run type Diskmgmt.msc and part the Disk Partition. So Guys like me If you are also a Big Fan of Android OS and want to Use Android OS on your PC in Daily Basis, then you can easily Download and Install This Remix Os on Your Pc with Resident Mode. So all your apps and Data will be stores in your PC. Like normal windows. So if you want to install This os then select Resident mode, Else select Guest Mode. So think twice before Selecting option of Guest Mode or Resident Mode while installing Remix Os in PC. 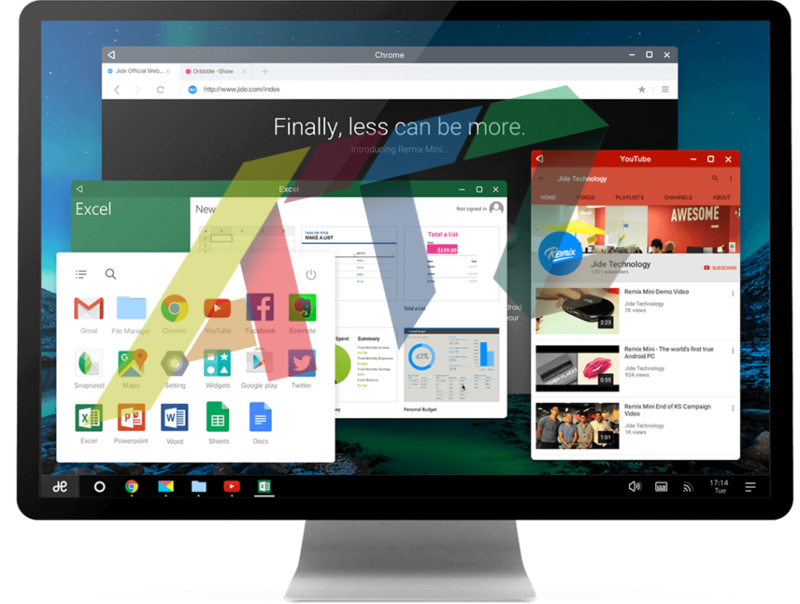 Now you have Successfully Installed Remix OS onto your PC / Laptop without any Issues. Now you can Use this OS on your Pc and I Hope you will Enjoy this OS. This is the first Android Based Operating System for PC. According to me i hope that there will be more and more Development will go for this OS. before some days, we was able to run Android app on PC with the help of Bluestacks, but now we don’t need any android emulator fro run Android Apps / games in PC. because Now you can directly install remix OS on your PC and enjoy Android Interface in your PC. So guys whenever you Restart your PC it will Show you a menu, that operating System you want to use Like Below Screenshot. Friends this was the very Easy Full Tutorial, on How to Install Remix OS in your PC but as you know, it need some basic things Like USB 3.0 and much more requirements. Previously we was shared Best Fast Charging Android Apps. Many Peoples Still use USB2.0 pendrives and they don’t have USB 3.0 Pen Drives. So what can you do? of you don’t have USb 3.0 but you want to Install and Enjoy Remix OS we have a Solution for this thing too. You can Easily and Without any Risk of data Corrupt or anything, install Remix OS in your Pc also Checkout How to Hack Wifi With Mobile, if you want to access your friends wifi. It’s a very Good and Smart idea to Run Remix OS in Virtual Box, Specially when you are newbie in PC world. and you don’t want to mess up with installation process or Dual Boot, Which i Mentioned in above easy step. So guys if you would like to Install Remix OS in virtual Box then simply checkout Full Guide now from Below. Above is the Full Tutorial in which you will get Step By step Full Guide for installing remix OS in PC, with the help of virtual Box. If you have any issues, while understanding this guide, then you can simply follow this Full Guide an if you want i will make a Video Also to follow it in right way. So follow all Step by step Tutorial. you Will Get Full Information on How to Install Remix OS in your PC. it will not Actually install Remix OS in your PC. So it will install in Virtual Machine and your PC will not be affected. Once Disadvantage of installing Remix OS in PC is, you will not Get Maximum Performance in Remix OS of you install on Virtual Box Machine, because it will load the Both Windows and Remix OS Os at same time, but this is the very Safe way for using Remix OS. 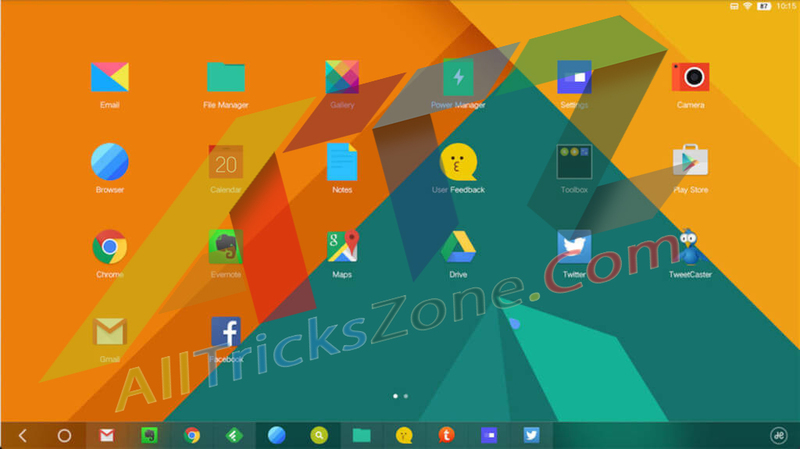 So, Checkout Full Easy Tutorial on How to install remix OS in Virtual Machine. That’s it guys, now we are done, This was the Very Easy and Full Step by step Guide for Install Remix OS in Computer or a laptop pc. This guide will work only if you follow all Step by step Guide in a right way. if you Skip any of the step then it may case some issues for you. So it is Necessary to follow all Steps carefully. If you want to know How to Uninstall remix OS or have any questions or Suggestions regarding this Guide, then obviously feel free to comment in below section. I will try my best to solve your issue even you have problem with remix os stuck on boot screen. Also See This Copy of Windows OS in Not Genuine Error Fix for Windows 7. So thanks for visiting Keep connected with us for more cool stuffs like this.